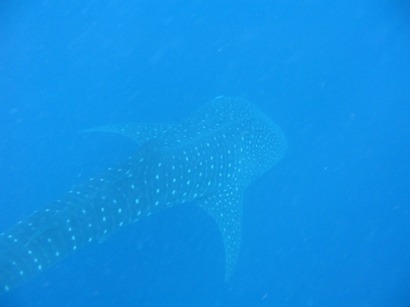 Here are some pictures of our whale shark adventure of a few days ago. We didn´t take them - a terribly nice American chap whose name I forget did and he kindly passed them on. 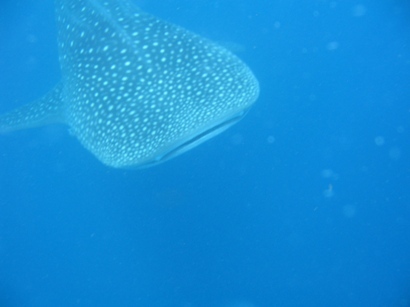 I’m going to show my babes your whale shark. They’ll love it! Sod learning about the history of Waltham and electricity but we will stick to learning how to read and use a map. We’ll learn about whale sharks for an afternoon! Really enjoying your blogs and your travelling adventures. It’s just like Uncle Travelling Max in Fraggle Rock! I’m with Keir on this one - you are having too much fun now, and should come home and stop enjoying yourselves. Wasn’t Fraggle Rock a fantastic programme? Uncle travelling max was pretty cool but I liked Red best! But Graeme and Keir are right, you are having to much fun whilst the rest of us are working hard, dear brother! You need to come home for Christmas and face the silver christmas tree that mum wants! Grumpy Keir and El Groucho Graeme and now Lorna too - tough. They seem to be having a great time and have now moved on to Belize, with an old fashioned modem! Grumpy and proud. Hey they should try living in a little village in scotland for a while! That will teach em what slow internet is! To all those people who want us to stop having fun, I’m afraid you’re going to have to get used to it as we’ve still got another five months to go… Why don’t you quit whingeing and just come and join us? !